32 Pin TSSOP 0.8 mm pitch footprint going to pads on 0.100" centers. Put headers on and solder to larger board or plug into white protoboards. SOIC area for putting regular or WIDE IC's or using it for building larger discrete circuits. Use the traces to put 1206/0805/0603 parts across, and cut them to fit your circuitry. Lots of room to put many caps and resistors on this board to SOIC or 0.8 mm pitch parts. Use some imagination to make prototype circuits! This is better than cutting your own protoboards or making breadboards from the laser crap. Use the Proto-Chip SMD pads to wire up discrete parts and the micro pads to make traces or use as solder pads for transistors, etc. Ground plane on back, power traces on board edges, Solder mask on top and bottom. 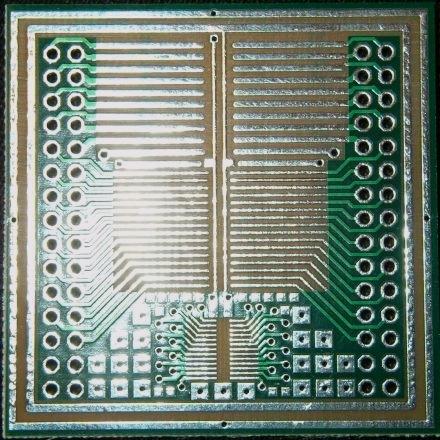 Fits most regular width pitch IC's. Always the BEST SMD Protoboards.